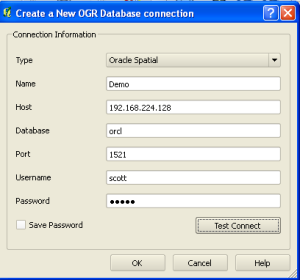 How to connect QGIS to oracle spatial. QGIS can now connects to oracle to view spatial data and process it, great news for an open source software believers. As a newbie to QGIS user, i can just give a way, that i connected to it. 1.) 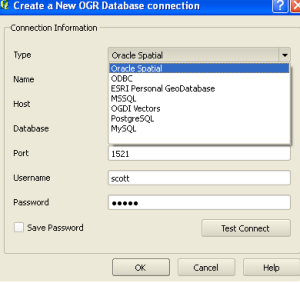 Firstly you should have downloaded QGIS with GDAL/OGR required oracle library for bridging oracle connectivity and must have installed oracle on your machine. 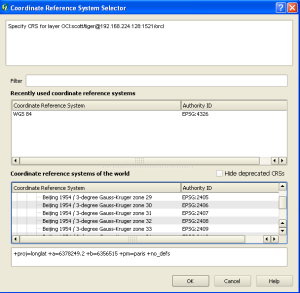 If oracle library is not installed, see the following post : Install QGIS for oracle connection via OSGeo4w. 3.) A new window will pop up on clicking the above, now select Database Radio button as appeared in Source. 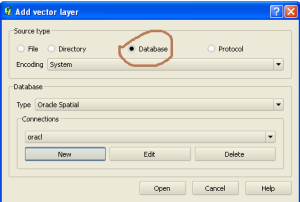 Now in Database Type drop down box, select Oracle Spatial. If you have properly installed QGIS with the requirement stated above Oracle spatial would be present. 4.) 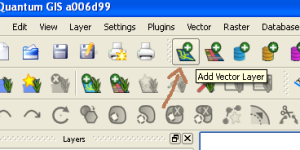 In the same Add Vector Layer window, select new button under connection label. This will open up a simple form with following Connection information to be filled, i.e, Type, Name, Host, Database, Port, Username and Password. a.) Type : In type select oracle spatial from drop down box. d.) Database : Write database name, i.e the name you have given while installing oracle software. Now select Test Connection button. This will pop up another window which gives you an information of your successful connection, as shown below. Note the string url connection to connect QGIS to oracle spatial and click OK. 5.) Again in the vector data layer window, select the connection that you made named as Demo and click on Open button. 6.) Now select the coordinate system for your database, which will be prompted after proceeding from step 5. 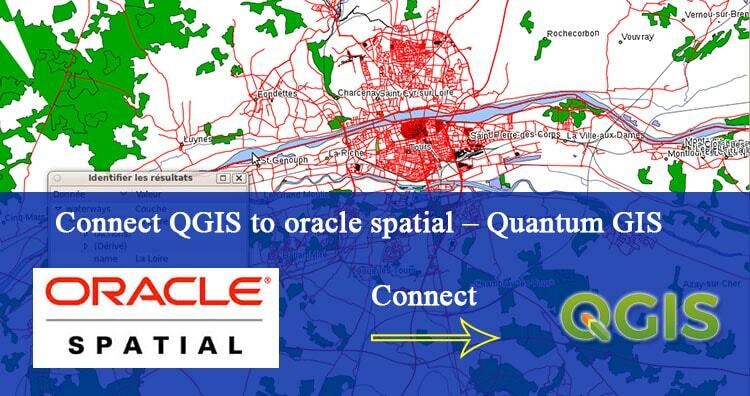 Feel free to comment below, if you are having any problem to connect Oracle Spatial to QGIS Quantum GIS (Geographic information System) or if you want to discuss for the same topic. 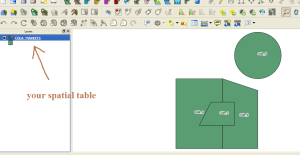 You can also see QGIS tutorial further. And yes, don’t forget to subscribe and follow on twitter for getting updates related to GIS post. I can’t export from oracle spatial to shp using QGIS 2.6.1. Troubles with blob field. Some advice?? Do you know if QGIS can connect to an specific Oracle workspace if the spatial table is versioned? I’m actually connecting qgis with oracle 11g XE. I can visualize a layer of points stored into oracle but i’m not able to edit it. It is possible to edit (move, create new, delete, change attribute table,)a vector layer stored into oracle through quantum gis (v.2.4)?